Courage refers to the willingness for risk taking and to move ahead in the presence of difficulties. 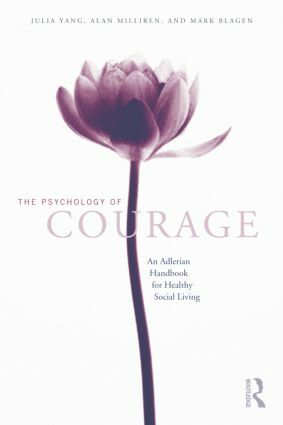 The purpose of this book is to present courage as the main foundation of understanding and training for mental health in the three life task areas described by Adler: Work, Love, and Friendship. It explores the meaning of each life task and problems of fear, compensation, or evasion, as well as Adlerian insight on socially useful attitudes of approaching the task under discussion. Socratic dialog boxes are included throughout each chapter to encourage the interactivity between the text and readers’ thought processes. Also included is a set of twenty-two helping tools that were creatively designed for self-exercise or to be used to help others uncover or acquire courage. For those in the helping professions, this text will be a unique and valuable handbook for not only working with and helping their clients, but also for their own personal development.